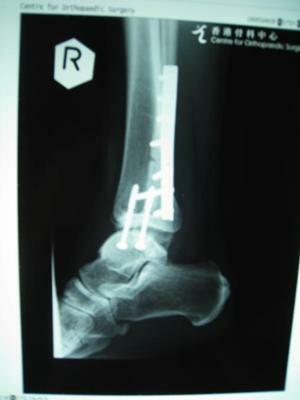 Feb 2008 - fell off whilst bouldering (rock climbing ropeless), fibula was protruding out of my skin, complete dislocation of the ankle joint, fragment of medial malleolus on the grass somewhere, cracked talus. Emergency surgery on the day, plate, screws, the whole nine yards, free heli lift, good times. 7 days later, second surgery, to put in a syndesmotic screw to close the gap between my fibula and tibia, I was told all was jolly. April 2008 - have been doing intense physiotherapy involving manual manipulation of the joint to achieve dorsiflexion since February, but ankle swelled up like pig's foot, got increasingly stiff, and pain around the fibula because a screw was coming lose. Sought 3rd opinion from yet another surgeon. Surgeon was shocked to see my ankle joint was half out, it was not put back in properly initially. Had a 3rd surgery, where the surgeon tried to shift the joint back without success, it was rigid. I then sent my x-rays to many surgeons around the place seeking opinions. July 2008 - still limping on one crutch, still painful, no improvement on range of motion, decided my best chance was probably a major open ankle surgery to fix the half out joint and other problems. of all the fractures, aligning the bones properly this time, putting back the ankle joint, digging out scar tissue, reattaching the anterior tibiofibular ligament that was never re-attached, repairing a fracture that was mis-matched, basically, fixing the poor job the first surgeon did during emergency surgery. 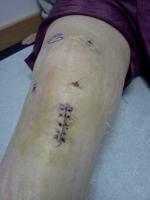 An external frame was fixed to my leg for 4 weeks, it was heavy and painful, such as life. October 2008 - still limping with pain, still doing physio daily, frankly pretty sick of it all, and miss climbing terribly. I have been told due to the irreparable cartilage damage to my ankle, and the delay in getting it fixed, I am unlikely to get back 100% range of motion, and is a perfect candidate for osteoarthitis much earlier than usual. I remain optimistic and am persevering with aggressive physio. I keep thinking if the emergency surgery was done competently I would not be crippled like I am now, but who knows? I still want to be a medical miracle, for now I'll be glad if I can walk without looking like a fool and preferably without pain. I have to maintain hope otherwise I'd go bananas. My advice - it is worth your money and time to always get a second and third opinion if you're getting something fixed, don't wait around till it gets too painful, the time lost is yours alone.